The Parish Plan Grant Fund is available if you have a West Berkshire Council endorsed Community Plan and associated Action Plan, which sets out the priority projects for your local area. This funding represents a small pot of 'pump-priming' money to get local projects launched. There are certain criteria which must be met to access this capital funding. For more information please see our Find Funding for a Community Plan webpage. The Community Solutions Fund sits alongside our Devolution Programme and is there to offer some initial one-off funding to support local communities that have an interested in taking over and running community services and assets. This is a jointly funded scheme run in partnership with Greenham Trust. Bucklebury Community Bus and Hungerford Library have both benefited from awards under this scheme during this year. Please visit our Funding webpage on the Parish Portal for more information on the criteria. 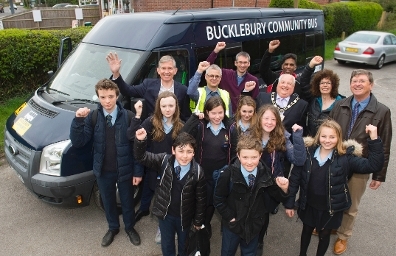 Bucklebury village needed a more reliable school transport link between Bucklebury and Kennet School, Thatcham. A group of Bucklebury residents came together and applied for grants for the £14,000 needed to run a community bus service. The new vehicle was largely funded by the Community Solutions Fund which gave £12,000 to the project. The bus will also be available for primary school use during the school day and will also be used to transport villagers to from events within the parish such as the Candle-Lit Carols and the Bucklebury Beerfest. The 'Friends of Wash Common Library' group applied, through West Berkshire Council's Devolution Programme, to take over the running of their local library. The new community library is now run by local volunteers and is independent of the library service run by West Berkshire Council. See a volunteer's perspective [15kb] to learn more about their journey.